The NJ Department of Environmental Protection Division of Fish and Wildlife has proposed a Forest Stewardship Plan for the 3400-acre Sparta Mountain Wildlife Management Area that would remove between 100-300 acres spread over multiple cuts of canopy forest over the next ten years to create habitat for “young forest” bird species, nearly all of which are abundant in New Jersey. The SMWMA Plan proposes actions that will cause serious harm to forest health, resilience, and wildlife by fragmenting and impairing intact and biodiverse mature forests. Creating large forest openings within SMWMA will cause far more ecological harm than do good. These are priceless forests, whose unbroken extent is key to their health, resilience, value for native species, and landscape- and state-level importance. The SMWMA plan does not treat the forest as a complex ecological system of natural communities, but rather as a system of 33 tracts of timber commodities. Further, this 10-year plan is a clear precursor to logging and harvesting virtually the entire 3400-acre SMWMA over the next 50 years. Click the map image for a full-sized version. The proposed Forest Stewardship Plan fails to meaningfully address water quality and water supply issues of critical statewide importance. Sparta Mountain WMA contains headwaters of the Wallkill, Raritan and Passaic Rivers, as well as the Town of Newton’s surface water supply, the Morris Lake Reservoir located in Sparta Township. Groundwater infiltrated in SMWMA feeds wells within, adjacent or near the WMA, as well as supporting the base flow of streams and surface waters. Specifically, SMWMA comprises significant headwaters of the Rockaway River Watershed, part of the Passaic watershed, which supplies Jersey City’s Splitrock and Boonton Reservoirs. These waters begin their journey high on Sparta Mountain, in its many lakes, ponds, wetlands and tributaries, among them Ryker Lake, Collins Pond and Russia Brook. 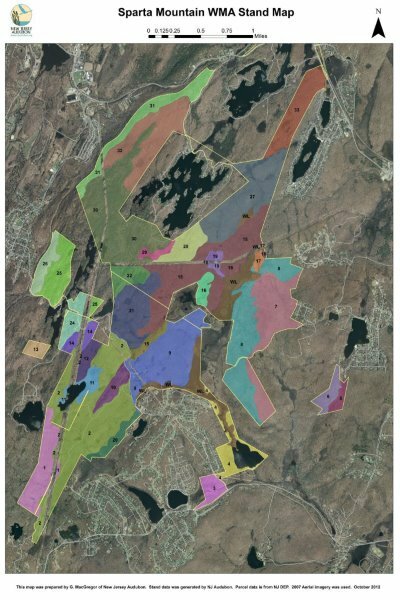 The proposed Plan fails to address or respond adequately to the critical statewide importance of the SMWMA as a public water supply watershed. It is not worth putting at risk these crucial water supply bodies for the implementation of a flawed Forest Stewardship Plan.